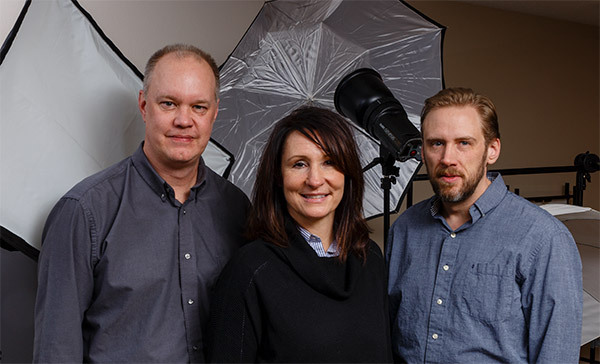 Nicollet-based trio have been creating graphics and imagery to help companies market their products for over 20 years. Technology changes rapidly, causing many companies to strain to keep up. But for the creative minds of Concept & Design in Nicollet, Minnesota, keeping current with technology in the visual media field is less about changing and more about expanding capabilities. As the first graphic design and illustration studio in the area, Concept & Design remains a pioneer in using cutting-edge methods, according to Graphic Designer and Photographer Kris Kathmann. When Jeffry Irish started Concept & Design in 1979, much of the technology that the design studio uses today seemed futuristic. However, the early days involved some influences from science fiction, according to Illustrator and Photographer Jonathan Smith, who has worked at Concept & Design since 1984. Smith remembers creating special effects photography modeled off film compositing techniques used in Star Wars before computer imagery became ubiquitous. “It was an attitude of innovation and experimentation, and of creating styles that practically no one else was doing. We still do that, but obviously with different media nowadays,” Smith said, adding that they adopted desktop publishing software in the late ’80s. A specialty of Concept & Design is using 3D illustration to create promotional product imagery. The company specializes in a range of services, including a variety of illustration styles, 3D modeling and rendering, product photography, advanced retouching, branding design, and product and packaging design, among others. Possessing a wide mix of skills also helps them produce print publications, such as Connect Business Magazine, which Concept & Design has published for more than two decades. The studio can still produce in traditional media, such as paint or pen and ink illustrations, if it fits a client’s aesthetic, but practically every company logo, 3-D rendering or corporate brochure takes shape digitally without appearing on paper until it goes to print. The rise of computers, tablets and smartphones has changed how designers create graphics and the ways that people encounter them, said Kathmann who started working for the company in 1994. After Irish retired in 2015, the three employees — Kathmann, Smith and Office Manager Becky Wagner, who has worked there since 1985 — took ownership of Concept & Design. They’ve served a varied clientele including Avery Weigh-Tronix, Kato Engineering, TRAC Outdoors, August Schell Brewing Company, and Compart Family Farms. This requires the design team to meet with each company and learn about its unique identity and market. On occasion, clients will already have in-house design or marketing teams to oversee their branding, but Kathmann and Smith offer specific services to help them realize their visions.